We are very happy that you have chosen to celebrate the beginning of your married life at Saint Francis of Assisi Church! This covenant that will take place between you is a sign of love, devotion, and unity in Jesus Christ. In order to facilitate your preparations, the following steps need to be completed to prepare for your wedding day. If you have a prior bond of Marriage (divorced) and this is not the first marriage for one or both of you, and your former spouse is still living, you must obtain an Annulment before you can plan your wedding. You need a copy of the license from your previous marriage(s); the divorce decree(s). Then make an appointment with the Priest or Deacon. The duration of the process varies. A marriage cannot take place before this process is concluded. The Catholic party must present a NEW baptism Certificate (within 3 months) from their Church of Baptism. Baptized Non-Catholics are to present a copy of their Baptism Certificate or Letter of Baptism. Two "Affidavits Concerning the Freedom to Marry" (you can print from the provided link or see the webpage "Forms>Diocese of Venice" to access and print the form from the DOV website) for each party (four total) are required. These forms must be completed by an adult who has a personal knowledge of the bride or groom. These affidavits must be signed in the presence of a Priest or Deacon. 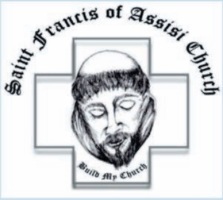 If you are not a registered member of Saint Francis of Assisi Church but wish to be married at the church, all paperwork including marriage preparation must be completed in your home parish. You must also secure a "Letter of Permission" signed by your Pastor. The Pre-Nuptial Questionnaire will be completed upon your initial visit with the Priest or Deacon. If you are from out of town you must contact a Priest in your local area in order to fill out the proper forms. The date and time of your wedding must then be arranged with the Priest performing the wedding at Saint Francis of Assisi Church. You must complete either a Pre-Cana or Engaged Encounter Weekend before your marriage. You can attend one of these in your area of residence. Contact your local church for upcoming Marriage Preparation Programs. In addition, trained ministers will administer and review FOCCUS (Facilitating Open Couple Communication, Understanding and Study) with you. FOCCUS is a survey designed to clarify your values and priorities, as well as to highlight potential conflicts which might warrant your private discussion before your marriage. Please contact our Music and Choir Director at 941.697.4899 Ext. 7200. The Music and Choir Director is responsible for helping you plan the music for your wedding. The fee for the organist is $175.00 and to be paid with the Church fees. Please consult the Officiating Priest for scheduling your Wedding Rehearsal. Flowers are your own choosing. Please arrange with the florist to have flowers delivered to the church one (1) hour before the ceremony. Please Note: It is customary to leave the altar flowers in the church after the wedding ceremony. Runners, candles or dropping flower petals on the aisles are not permitted. Couples should apply at least two weeks in advance for their marriage license at the Charlotte County License Bureau. You may wish to apply for your license online at the following link, Charlotte County Marriage License. This marriage license is to be submitted to the Parish Office at least one week prior to the wedding. You and your wedding party are to arrive a half hour prior to the wedding. You are expected to start at the specified time. This is in consideration for those scheduled for the next rehearsal, wedding, or scheduled Mass. Photography is permitted, except in the sanctuary. However, it is essential that your photographer remain as unobtrusive as possible, so not to detract from the solemnity of the occasion. Please note that because of the schedule of Masses, weddings, and the weekend Mass schedule, the wedding party will be obliged to vacate the Church 30 minutes after the wedding ceremony concludes. The Photographer should contact the officiating Priest before the wedding in order to discuss appropriate and inappropriate areas in the church for taking pictures. No alcohol is to be brought into the church building the evening of the rehearsal or the day of your wedding. If in fact there is evidence of alcohol, the wedding will be canceled since this put a condition on the actual marriage vows which nullifies and voids the ceremony. There is to be no throwing of rice, birdseed, confetti or flower petals inside or outside the Church or on the grounds after the wedding. It is customary for couples to make an offering to underwrite the cost of the marriage preparation, documentation and processing, rehearsal, ceremony, air-conditioning, lights, and maintenance. 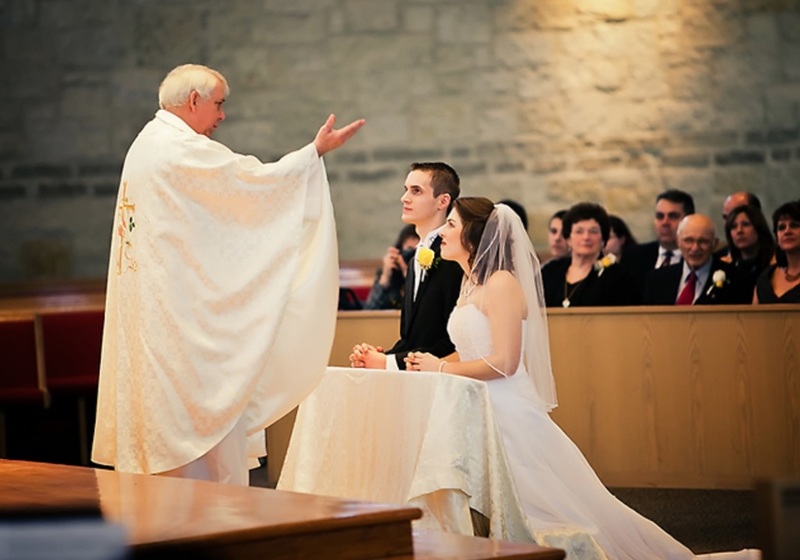 The amount of the offering varies according to the degree of affiliation that the couple has with the parish. A non-refundable deposit of $100.00 is required when the wedding date is entered in the Mass Book. All remaining fees are due and payable two weeks before the wedding.